Painted aluminum window frames are common on older houses that were built before newer vinyl frames were used. The paint on window frames will show wear over time, and the frames will need to be repainted to improve the look and function of your windows, especially since the paint acts as an insulator, keeping out some of the cold. The part of the aluminum window frame that is inside your house can be painted with standard wall paint; the exterior should be painted with exterior house paint. Aluminum window frames can be painted any color to match your decor. Lay the newspaper down on the floor in front of the window. Set up the stepladder under the window so that you can reach the upper section. Use the scraper to remove any loose paint chips. Wash the window frame completely with soapy water and a sponge. Dry it thoroughly with rags or a handful of paper towels. Mix 1 pt. of paint thinner into the 1-gallon container of oil-based primer. Pour 2 inches of primer into a paint pan. Dip the brush into the primer and apply a thin coat to the entire window frame. Allow the primer to dry for 24 hours. Wash the brush and paint pan and allow them to air-dry. Pour 2 to 3 inches of the interior paint into the paint pan. Apply the paint to the window frame with the brush until the frame is completely covered. 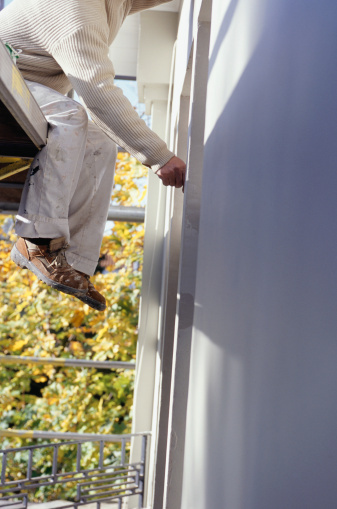 Allow the paint to dry for three or four hours before applying a second coat, if needed. Let the paint dry thoroughly for 24 hours before hanging up window treatments. Repeat these steps to paint the exterior section of the windows, only use the exterior latex paint instead of the interior.